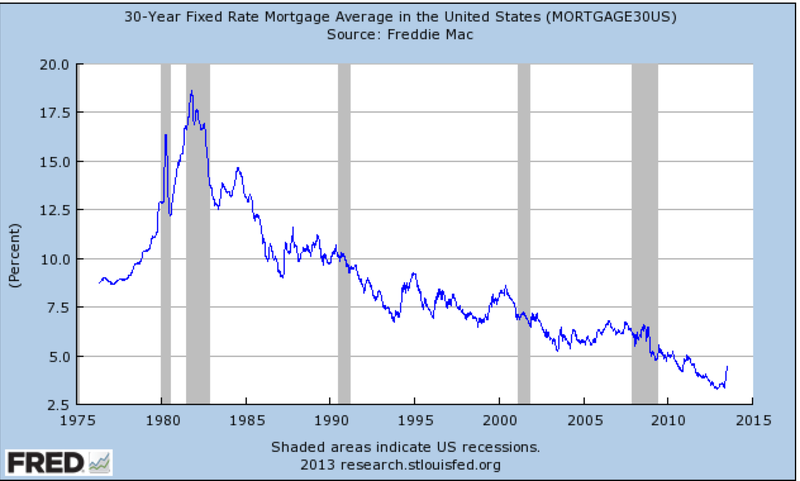 Krugman's post is about the terrible taper -- that interest rates on home mortgages have skyrocketed since the Fed has been discussing tapering off its bond purchases. The key line Krugman offers, "Do you really think that this will have no effect? Really, really?" Given the graph he presents and his tone, it's hard to argue with this. 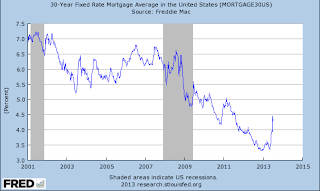 Now, I'm not a macroeconomist, but I don't recall what is special about June 2012 to use as a baseline for 30-year mortgage rates. 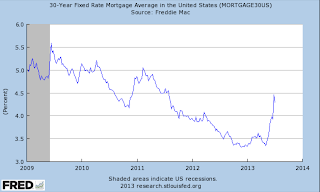 It seems to me that bond buying, stimulus of all sorts, weak demand, and the like predates June 2012. From his post, it looks like Krugman picked June 2012 because that's when some commentators began "talking of tapering," but it's not clear to me this is the right baseline. 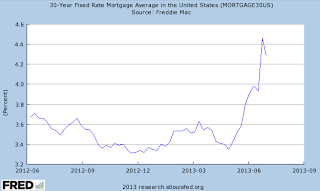 From any of these alternative timeframes, interest rates today look relatively low. 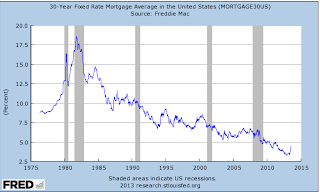 I'm not sure that putting the rates in historical context does much to refute Krugman's point that the recent increase in rates matters, but at least, it plants the seeds of doubt about the magnitude of the effects we can expect. 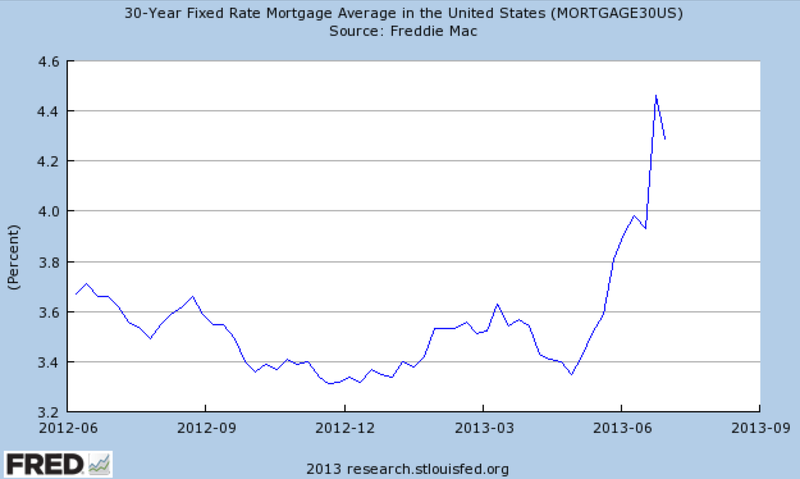 In contrast to what your eyes tell you from looking at the first graph, today's rates are not an unprecedented high. 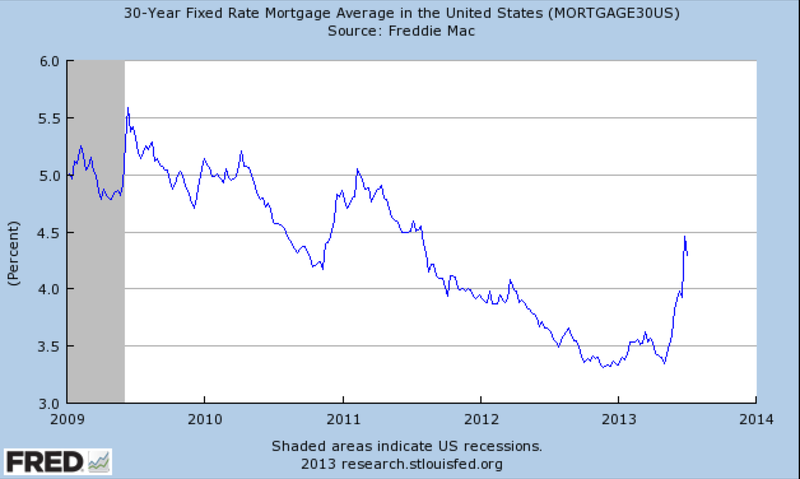 Rather, rates from the past year were an unprecedented low. This is a case where zooming in changes your perspective. This all reminds me of an excellent post by Justin Wolfers at Freakonomics, "How to Spot Advocacy in Science: John Taylor Edition." As John Taylor had a reasonable response to Wolfers, I'm sure Krugman has a reason for his choice as well.